Ava Tillmann earned the win for Ole Miss (22-18, 5-13 SEC) after holding State (32-12, 6-9 SEC) scoreless in the final three innings, allowing only two hits and a walk, striking out three. Cox made her presence known early as she led off the bottom of the first with a triple to center field. The speedy Henderson, Tenn. native scored off Kylan Becker’s grounder, beating the tag at home to give the Rebels the early lead—and entering the record books at the same time. 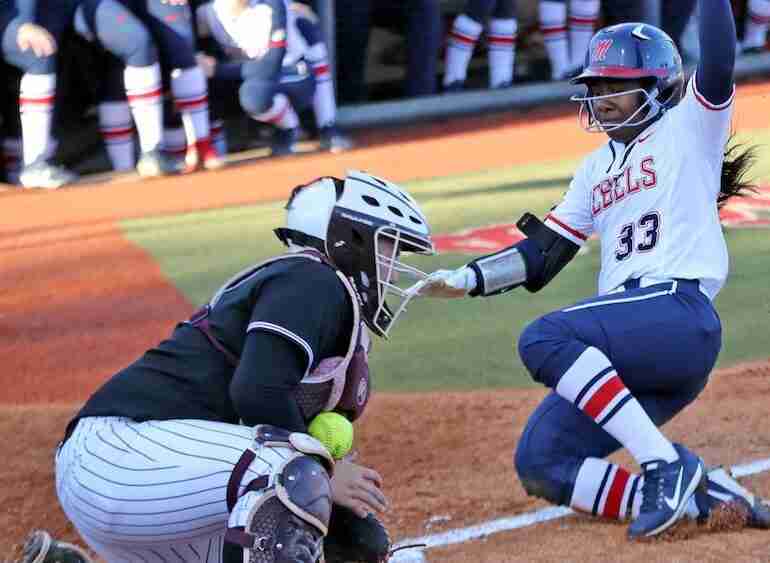 The run marked the 141st time the senior crossed the plate, giving her the all-time record for most runs scored by any Ole Miss player in school history. Becker later stole second, and when Dylinn Stancil singled up the middle, Becker scored to make it 2-0 at the end of the first. The Bulldogs fought back and tied the game in the third inning off a two-run homer from Mia Davidson to left field. The Rebels, however, came right back and regained the lead in the home half of the third to go up 3-2. Ole Miss’ lead didn’t last long as MSU tied the game in the fourth on a Carmen Carter RBI single to left. Carter Spexarth would then pound a pinch-hit three-run home run to right-center that gave State a 6-3 lead going into the bottom of the fourth. Undaunted, the Rebels never quit. In the bottom of the fourth, Paige McKinney bunted an infield single, then moved to second on a fly out to center, then stole third, before ultimately scoring on a wild pitch. The lead was down to two runs at that point, with State holding the 6-4 advantage after four complete. The Rebels capped off the comeback in the fifth as a single, a walk and a HBP loaded the bases. Amanda Roth then drew a walk to drive in a run, and Cox completed her record-breaking night with a strong single through the right side, plating Kaylee Horton and Autumn Gillespie to give the Rebels the lead again at 7-6. In the seventh, the tying run for State again reached third, but freshman Tillmann was up to the task, fanning State’s Carmen Carter to seal the victory for Ole Miss. Ole Miss has won the final game of four of its six SEC series in 2018. The leadoff runner reached base for Ole Miss in five of six offensive innings. Senior Elantra Cox became the all-time leader for Ole Miss in career runs scored with her run in the first inning, crossing the plate for the 141st time. The leadoff triple for Cox was the eighth three-bagger in the slapper’s career, moving her into a tie for second in program history. After going 1-for-2 with a sacrifice bunt on Monday, Kylan Becker posted a .778 on-base percentage for the series. Becker scored a pair of runs in the game, moving to 24 on the season. That total is second highest on the team behind Cox’s 27. The win in the circle improves Tillmann’s season record to 3-3. Tillmann leads the Rebels with a .211 opponent batting average. Ole Miss returns to action Wednesday as they host ULM in a midweek non-conference game at the Ole Miss Softball Complex. The game is scheduled for 6 p.m. and will be streamed live on SEC Nework +.